Are you worried about saving for your child’s college tuition? If so, you’re not alone. A recent survey shows that more than 80% of parents have at least one worry about saving for their child’s future college tuition. Is the worrying justified? You might be tempted to say “Yes” as you think about the rising cost of a college education. But it’s not all doom and gloom en route to the dorm room. There are a number of ways to help offset your child’s college tuition costs — such as financial aid, scholarships, grants, and the Gerber Life College Plan. Starting to save now, even a little bit at a time, can help ease your worries about saving for college tuition. 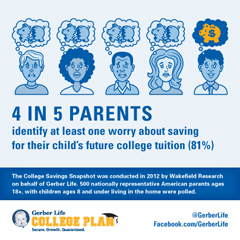 Find out how you can get started today with the Gerber Life College Plan.